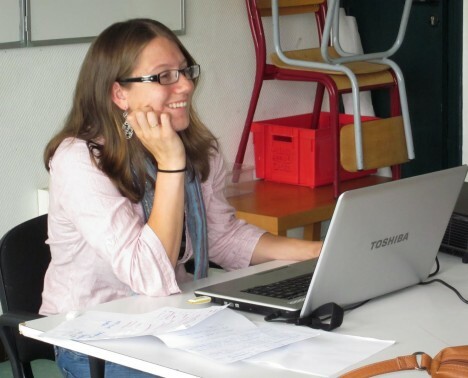 Testimony from Rebekah about her European Voluntary Service ( EVS ) in France. Project supported by the Youth In Action programme of the European Union. I now volunteer at an organisation called the “Mission Locale de Lille”. They work with 16 to 25 year olds who may not have much education, may be disadvantaged in life or may be unable to find employment. I am specifically in the “Europe and Citizenship” branch of the “Mission Locale”, which helps young people to volunteer in another country with either the European Voluntary Service EVS or Leonardo de Vinci programmes, who rather than general volunteer placements offer work experience related training placements, which are also voluntary. This helps the young people to achieve international mobility. It is a very stimulating environment, helping out people who otherwise may never have the opportunity to go abroad for any long period of time. Currently, I have been working a lot on developing materials to run English workshops for youngsters that are subscribed to a Mission Locale who are preparing to leave for a project. Most of them will leave on the 1st weekend of September. It has been very challenging trying to prepare the materials, because there are a wide range of abilities within a small group and rather than it being formal like school, it needs to be more fun and informal, mainly practising speaking skills. As well as planning the workshop activities (for which I now have a large collection of activities), I have been doing a lot of linguistic work. I have learned a lot of new words and I think slowly but surely my grammar is improving. I have definitely noticed that I can now understand more if I concentrate (though it is still very hard work!). There have also been a number of meetings that I have attended with Yves, varying from meeting with other coordinators in other Mission Locale’s, such as in Arras, to a welcome meeting for people who want to do a Leonardo Da Vinci project and another meeting for those who would like to do an European Voluntary Service ( EVS ) project. I also sat in a preparation meeting with the coordinator from the “Mission Locale de Douai” and the volunteers who are leaving on the 1st weekend in September. She was discussing their welcoming countries with them and preparation beforehand and I was so amazed that I pretty much understood it all! Definitely gave myself a pat on the back for that one!!! The more competent I become at French, the more varied roles I may be able to take on. For now however I am really trying hard to improve my understanding and communication so that I can effectively say what I want to. I have already prepared a presentation about my background, my home country, my sending organisation, welcoming organisation and the European Voluntary Service EVS, but I am yet to deliver it. Who knows, maybe soon?! Project supported by the Youth in Action Programme of the European Commission.